The Ithaca College wrestling program is one of Division III’s most successful, including three national team titles (Ithaca is one of only five schools to win as many), plus a total of 10 top-five team finishes at the NCAA meet. The IC Bombers also have 33 top-20 finishes at the NCAA Championships, including seven individual national champions. Have you ever dreamt of being the ultimate fighting champion? 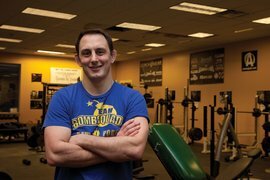 Ryan Ciotoli ’02 can train you to be one. The three-time all-American wrestler twice made it to the finals of the Division III NCAA tournament. After graduating from Ithaca with a degree in physical education, he stayed at IC as an assistant wrestling coach until 2008. While coaching at IC, Ciotoli developed a passion for mixed martial arts (MMA). He eventually began competing and later started Bombsquad, a team of local MMA fighters. Now Ciotoli owns and operates Ultimate Athletics, a fitness and mixed martial arts training center with locations in Ithaca and Syracuse. The Bombsquad—including reigning Ultimate Fighting Championship (UFC) light heavyweight champion Jon Jones—trains at Ultimate Athletics and has sent fighters to the UFC, Strikeforce, and Bellatore championships.